News from Vermont News from Vermont # 350 Apples. Apples, Apples Everywhere. Along with the usual burst of color and increasingly frosty mornings, we got an additional fall benefit this year…apples. Here in mid-November, folks are still exclaiming about the abundance of apples as a simple drive on any of our area’s back roads corroborates. Apple “spillage” highlights lots of roadside wild apple trees, trees largely unseen until a year like this comes around. Because of this year’s exceptional crop, those surprise trees extend beyond the roadways and out into our Vermont pastures and wood lots. And, for some reason, all that fruit is refreshingly quite free of worms and ready to use. In days gone by, before there were so many farmers’ markets, roadside stands, and pick-your-own orchards, we paid more attention to our wild apples. Every fall on both lean and abundant years, we’d go scrounge drops from wild apple trees. We never climbed the trees or used a ladder but just waited for the fruit to fall. It was easy to pick it up off the ground (no worries about deer droppings or an occasional slug and none of us ever died from drinking unpasteurized cider). One year when I was in my mid-teens, I decided to fabricate my own cider press. I had grown up learning from my brother Elliott and our neighbor Carroll Badger, who had both built their own small, home-made presses. I had the drive, and the apples, but dismally lacked their mechanical abilities. A cider press consists of two parts: a device to grind whole apples into mush and a press to squeeze cider out of that mush. For my grinder, I used a small electric motor from a washing machine, a belt, and a couple pulleys. The actual grinding device consisted of a round section from a Spruce tree with rows of nails pounded half-way into it. I drilled a hole through the round block’s center, give or take a bit, and inserted a metal shaft supported by end bearings and the pulley on one side. Around it, I built a rough board hopper which would allow the apples to slowly drop into the spinning grinder. Once I completed the assembly, all that was left was to plug it in for a test run. Suspecting there’d be only “minor bugs”, I wasn’t prepared for what happened…likely because of the “give or take” in my centering the shaft, that thing instantly became a lethal weapon twirling and tumbling around my parents’ basement. Worst of all, shrapnel from the “half-pounded” nails flew in every direction. I crouched in a corner, hands over my head, until the angry contraption finally blew a fuse and quieted. All that was left was a basement full of broken parts, a massive clean up job, and some shrapnel scars that I bear to this day! 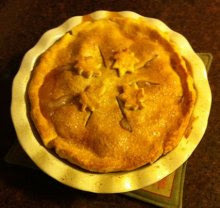 For a great apple pie recipe go here. This year there’s been a lot of homemade cider produced. Some, no doubt, sits hardening and will either result in “good batch” stuff for winter cheer or, more likely, foul tasting vinegar. Making good hard cider is an art that takes years or generations to develop, and most amateur attempts fail bitterly. At any rate, it was a pleasure to enjoy this fall in our own little Garden of Eden where fruit dropped freely and “unforbidden”, into the hands of folks who will continue to rave about 2015, the year of the apple.